My interest in London’s Docklands started when I was 7 years old, when my grandad took me and my brother around his work, when he happened to work for the GLC in the Surrey Docks, when the docks were being filled in and the land made ready for development. 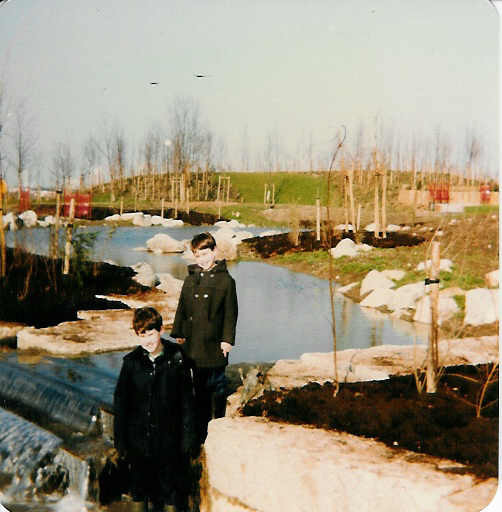 This is me in what is now a much woodier Russia Dock Woodland, with my older brother in front, in 1982; I have surprisingly clear memories of the area then, and remember clearly going along Salter Road before it was completed and open to the public, and going into the new Fisher Athletic stadium just before it was handed over to the club. Over the years I have watched Docklands grow, and have collected a fair amount of interesting material worthy of a wider audience, and that’s what this blog is for. I don’t expect to be posting constant updates, but will gradually delve into my stuff seeking items I think will be of interest. If this looks like the sort of thing that interests you, why not subscribe, and come back another time? Hopefully there will be something new, and if you find anything you think I would like, why not get in touch? Hi Tony, what a lovely blog. Thanks to Transpontine for pointing it out on his/her site. P.S. Do you tweet new posts? Thanks very much, glad you like it. I will tweet updates at @selondoner if you’re on twitter (although I may forget occasionally!!). What a great idea for a blog – the massive development around the Isle of Dogs, and its pre-1980s history, has fascinated me since I moved to London (just down the road in New Cross) four years or so ago. Very good and intresting read Tony. Hi Tony, I am very fond of Surrey docks as it was once known, as a child I also used to go downtown for the occasional dental visit and dread the long trek, it’s amazing how much has changed around here. I run several businesses in the area and usually keep up to date with what’s happening. I would love to contribute if I could. Did you read my article in the papers last week about the shard developers getting involved with the decathlon site? Hey tony! Fantastic blog! I lived in SE16 for a few years while working in London as an architect and love to see its development and history. Thanks! Hi Tony – this is all very interesting stuff. I lived and worked in London from 1979 – 1988 when I moved to Bristol. I remember the docklands in 1980 being rather run down and I feel it has certainly improved significantly since those days. Hi Tony, What’s the best contact address for you? Want to send you some info about From Docks to Desktops, our latest project that explores how changes in work have changed our community – focussing on Rotherhithe, Bermondsey and Deptford. Great blog! I used to live in Tillett Sq just off Salter Road and grew to love the area. Later on I lived on Brunswick Quay and became increasingly fascinated by how everything used to look before redevelopment. It’s interesting to think that such a pleasant and, mostly, green area used to be an industrial wasteland (though it was much more before that, of course). Anyway, kudos. hallo – very intersting blog – speical on the pictures of LT stations then and now. in view to theEast Cross Route there is a simular brochure on the northern approach which I have – and can send scans. Hi, thanks for visiting and your comments. I would be very interested in the northern approach brochure if you are able to send scans – many thanks for the offer! Hi there Tony – I recently rediscovered the two films made in Rotherhithe in 1982 by Michael Reardon’s parents on cine camera. fb.me/6CDgeE7ok and http://t.co/nz5B4HZtnc I thought you and your readers might find them interesting! Great site Tony. I was one of the pioneers of London Docklands, having moved down from a previous gig in Milton Keynes in March 1980. I joined the shadow LDDC which became legal on 2 July 1981 (we – the original 10 – were all nervous that it wouldn’t and we’d thrown away our careers) at around 12.10 in the morning when it went through the House of Lords, and 10 minutes later the vesting order went through which transferred the ownership from the Port of London Authority (who I have to say fought us all the way), LBTH, Newham and Southwark to LDDC. So we went home one night wondering if it would ever get through to coming in the next morning to find we were legal and owned 500 acres of land including Surrey and Greenland Docks, much of Wapping, West India and Millwall Docks and of course the Royals. I and my future best man, Mike Hill, tossed for who was going to focus on the commercial portfolio (attracting investment and jobs – office and industrial, mainly the Isle of Dogs Enterprise Zone) and who was going to focus on the housing. I got the former. Mike the latter and a few years later he joined Countryside properties with whom he still works. I left LDDC in September 1985, setting up the first West End commercial property agency for Grant and Partners, before being headhunted by Jones Lang Wootton to do the same in July 1987. In July 1989 I emigrated with JLW to Sydney, Australia (orders of the wife). During the 90’s I was 2 i/c to the City West Development Corporation, which redeveloped an area similar but smaller than Docklands in Sydney. During the 80’s I primarily lived on the Isle of Dogs, first in a Thames Barge, the Marjorie, outside the LDDC offices of West India House, Millwall Dock, and then Friars Mead adjacent to the ASDA and Mudchute and then when we were expecting our first child (of four) to a slightly bigger place at Locksfield. Am coming over to UK this weekend for a wedding and will head down to the docks. Will be only third time my wife has been across since we emigrated some 25 years ago (though I have been often). Will be seeing many old Docklands colleagues, including Peter Hadley, also ex Milton Keynes and was the the first Team Leader for the Surrey Docks and David Lock who led the planning of Greenland Docks. When I have a bit more time I can give you some great anecdotes if of interest. Sorry if this is a bit long, but my time in London Docklands was the most dynamic and exciting of my life and its great that many people are so interested in its history of which my time was just a small part. Thanks very much for your comments, must have been a fascinating time. Hope you enjoy your trip back here, and meeting up with your old colleagues. Sadly I’ve been rather busy and not been able to keep the blog up to date as I’d like, but please feel free to contribute anecdotes or any other material of interest, it would be great to capture some of your memories or those of your colleagues. I’m doing some research on Industrial sites next to the river as part of my Interior Architecture degree project. I’ve just begun looking at the London Docklands and after reading your interesting comment would love the opportunity to ask you a few more detailed questions on the area and what sort of place it was like. I’ve just stumbled upon your blog whilst gathering information about London Docklands as part of my Interior Architecture degree project. I’m in the process of looking through the interesting posts about how much the area has been developed over the last 30 years. I’d really appreciate the opportunity to ask you a few more detailed questions directly? I am trying to find material relating to the Broseley Estates Ltd developments in docklands. They were one of the first LDDC partner house builders back in the early 1980’s to develop on Salter Road, Western Dock, Beckton and a number of other sites. I wonder if you may have some material relating to their sites in your archives? I’ve noticed a few pics on here already relevant to the South Quay site they built.